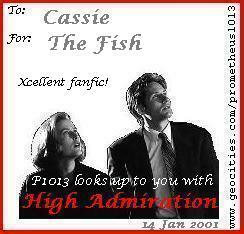 Author's Note: (I'm pathetic) This fanfic is dedicated to my late fish, Exley, who's tank I never got to clean. Ex was the first part of two as my inspiration, the second was the Madonna song "Cherish" ... remember the video? LOL I hope you like it and feedback would be nice. Disclaimer: They are not mine! Mulder and Krycek belong to the Noromo God that is Chris Carter ... and I guess he shares rights to them with 1013 Productions and FOX. "Oh, shh__. ", a frustrated Mulder said under his breath as he lay on his living room floor. Now how was he supposed to clean out his fish tank?! The pots and pans he was going to use to get his fish out of the tank had broken the glass jar (filled with water of course) that somehow he was going to put his fish in! Mulder laid on the floor for a few more moments ... What was he thinking of?! Taking the shelf apart to get to the tank? And why was he so stupid to have put such a big tank on the fourth shelf?! He rolled over onto his stomach and crawled over to the broken jar... realizing now that the water was soaking up into his sweatpants, he stood up. Since he didn't have a vaccuum cleaner, he decided to go ask Krycek for one. "Krycek! Open up! ", exclaimed Mulder, "It's me." Opening his door, wearing only a bathrobe, Krycek asked, "What now, Mulder?" "I need to use your vaccuum." "You mean you don't have your own?" Mulder pushes Krycek out of the way and starts opening and closing doors frantically .... he enters the bathroom. "Hey! Krycek! Do you need your bathtub?" asked Mulder seriously. He was dipping his hands in the water to check the temperature ... seemed just fine for what he had in mind. "Um, considering I'm about to take a bath, yes." "Hold that thought! ", snapped Mulder, pointing his finger at Krycek. Then he walked out of his apartment. A few minutes later, Mulder returns with a pot full of his fish. "Mulder, what in the name of God, are you doing?!" Mulder was gently dumping his fish into the bathtub. And waving at them. He turns to Krycek and simply explains, "Gotta clean the tank." At that, Krycek leaves his bathroom and plops down on his couch. Why is Mulder like this? Was he dropped on his head as a child? Or is this some weird idea of the Cigarette-Smoking Man? Mulder runs through the living room on his way out ... on his way to clean the tank. "Watch my fish!" He slams the door shut. "Oh yeah ... I'll watch your fish. ", thought Krycek. After awhile, Krycek stood up and went to find his fish net and old fish tank. After washing all of the dust out of his tank, he carefully got Mulder's fish out of his bathtub. Then spent a little time wondering why Mulder needed a vaccuum cleaner to clean his out. He sat on his couch staring at the three fish for quite a long while .... and suddenly burst out laughing at a though he had. He stood up and went to the bathroom and pulled the plug from the drain and watched the water empty. After getting dressed and finding his vaccuum cleaner, he headed over to Mulder's to see if he needed help. Since most everyone enters Mulder's apartment, he didn't bother to knock, he just walked right in. Hearing the door open, Mulder yells, "Be careful where you step! There's glass everywhere!" "Here's the vaccuum. ", said Krycek, not as confused anymore, and kinda relieved. "Great, just vaccuum up my mess." demanded Mulder. Krycek proceeded to do so and after about thirty minutes of showing Mulder the correct way to clean a fish tank, Mulder was ready to bring his fish home. As he and Krycek walked out, Mulder put his arm around Krycek and thanked him for being so helpful. As they entered Krycek's apartment, Mulder notices the fish on the living room table. "You got fish too?! My fish and your fish can be 'fishy pals'!" "Oh. My. God. ", thought Krycek, "Did I really hear Mulder say 'fishy pals'?" Mulder entered the bathroom , pot ready to gather up his fish ... but wait a minute ... there is no water in the bathtub, and no fish to be seen! "Krycek? What happened to my fish? ", Mulder asked nervously. "Oh, I forgot to tell you ... the drain doesn't work right ... water barely stays in it for too long. ", explained Krycek, lying. "B-but ... my fish. ", said Mulder as he got into the tub on his hands and knees, looking down the drain. Krycek walks into the room and rolls his eyes at Mulder, who is making 'fish lips' at the drain. "I'm sorry Mulder. You never gave me the chance to tell ya." He said, pulling Mulder up and out of the tub. That night, Krycek thought to himself whether or not returning the fish would be the best thing to do. Would they live longer under his care? Heck, he'll just give them back to Mulder on his birthday ... that's what friends are for .... kinda .... he just won't tell him it's his three fish.